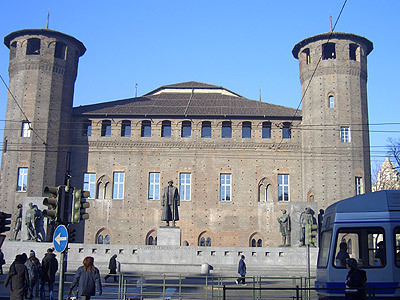 Turin is also famous for its typical “café’s” and its high class restaurants, which can be found along the arcaded roads: to frequent them, signifies becoming part of a great City tradition. Turin is known as a City of parks and water: crossing over the Po, whose banks face onto the magnificent Valentino Park, fixed up in 1830, and in whose interior we can find a true and proper anthology of architecture, in fact, there’s the Valentino Castle from 1630, the reconstruction of a medieval village and the modern Turin Exhibition Building. A special mention has to be made regarding the outskirts of Turin, which is rich in artistic and architectural works; beginning with the Basilica di Superga, which, at 10 km from the centre, dominates the City from above on a hill: constructed by Iuvarra in 1731 after a vow to Vittorio Amedeo II. Another architectural gem, still keeping outside the City, is the Villa Reale di Stupinigi, also by Iuvarra, projected in 1730, and being a luxurious, country-house for hunting by the reigning family. A last stop, this time for those whose passion is conceptual, contemporary art: in the Rivoli Castle – at 13 km from the City – there’s a seat of an important museum with exposition areas, which during recent years, has become one of the European poles for all current expressions of art. Turin hotels guide to choose your hotel, B&B and apartment in Venice by location, fee or category: secure bookings.